July 11, 2007, port and elected officials, along with Pacific Harbor Line personnel gathered to celebrate the commissioning of new low emission locomotives. The dual ports of Long Beach and Los Angeles, two separate entities, make up the fifth largest port complex in the world. It is served by numerous shipping lines bringing in many different types of cargo, ranging from containers of all types of goods, bulk commodities and automobiles. 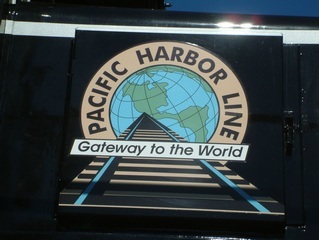 The ports are served by a shortline railroad, the Pacific Harbor Line or PHL, which interchanges with two Class I railroads, the BNSF Railway and Union Pacific Railroad. Most of the rail traffic utilizes the Alameda Corridor, a modernized rail line connecting the ports to the downtown Los Angeles railyards. 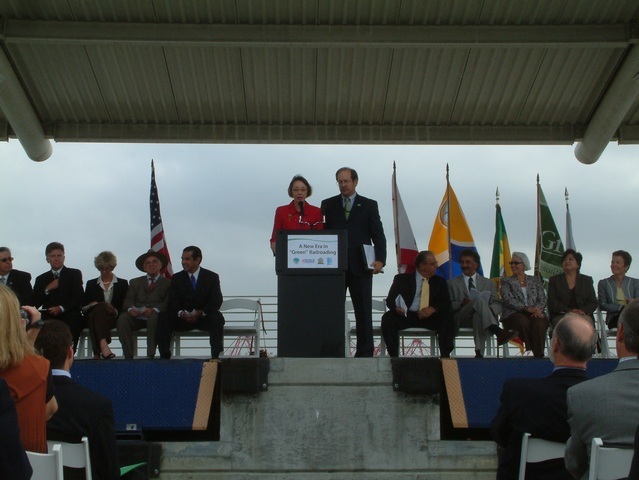 This dedicated, grade separated project opened in April 2002 to great fanfare. By consolidating rail lines and eliminating rail and vehicular grade crossings, time is saved for trains heading to and from the port. The public's benefit is less time spent waiting for trains to pass. The ports, by nature contribute air particulate matter and greenhouse gases through vessel powerplants which are left running while in the harbor or at berth, tractors hauling containers around the port, and locomotives moving trains in, out and around the port. According to the Clean-Diesel Locomotives Fact Sheet, "...emissions reductions are a key element to the San Pedro Bay Ports Clean Air Action Plan, approved in November 2006 by the Long Beach and Los Angeles boards of harbor commissioners." 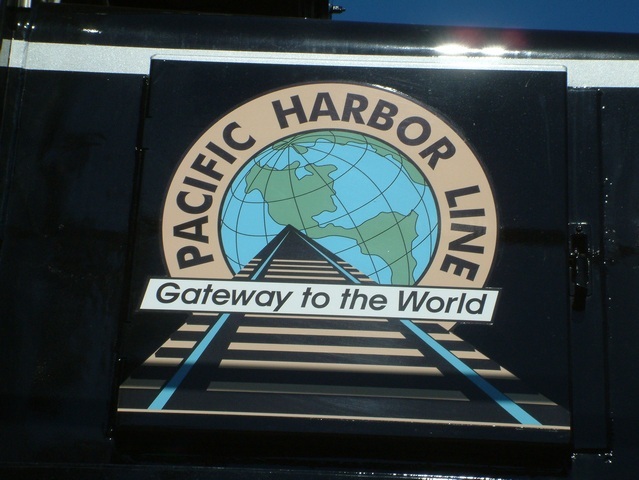 It was announced in late May 2006 that Pacific Harbor Line had awarded MotivePower Inc. a contract to supply 16 "clean diesel" locomotives. The order was is for 14 six-axle unit and 2 four-axle units for delivery in 2007. MotivePower's Boise Idaho facility is the site of the locomtives remanufacture, delivering the first unit in April 2007. 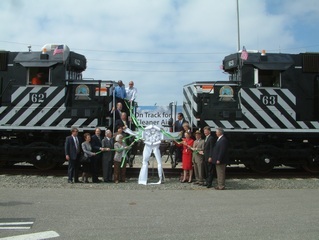 The delivery rate is to be 2 locomotives per month through the end of 2007. 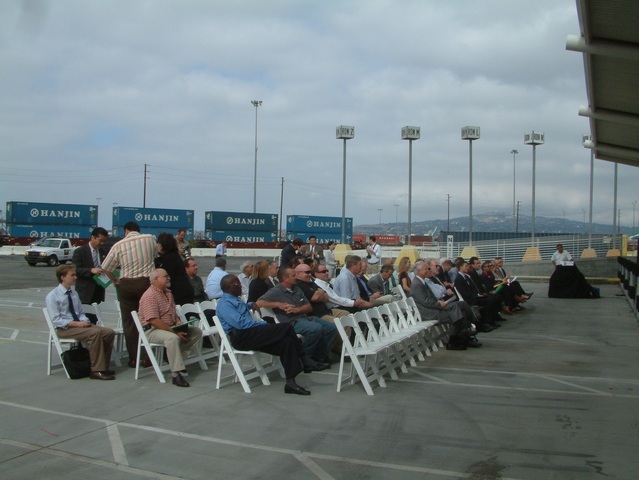 According to the Port of Long Beach August 26, 2005 Ppress releasePDF the new diesel engines "exceed U.S. Environmental Protection Agency "Tier 2" standards for reduction of air pollutants." "The use of these replacement locomotives equates to removal of more than 200 tons of NOx and five tons of particulate matter each year." "Under the tentative accord, the ports will pay as much as $5 million toward the estimated $23 million cost to replace the PHL locmotive fleet, with the balance coming from PHL ($10 million) and a $3.2 million Carl Moyer grant form the South Coast Air Quality Management District." 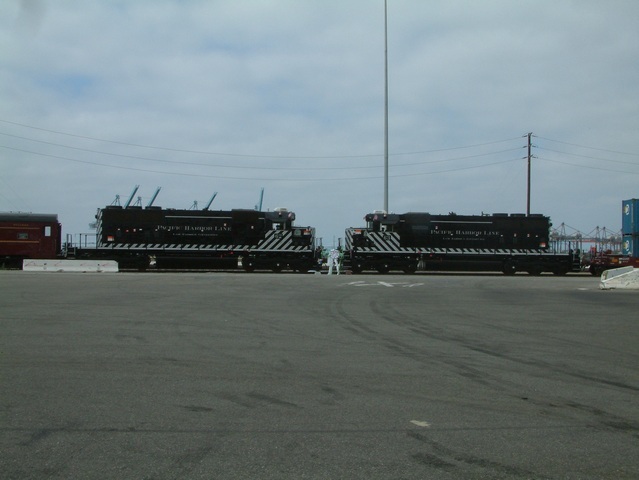 According to Port of Long Beach Executive Director Richard Steinke, "The U.S. EPA has adopted strict regulations for new switcher locomotives, but no regulations require the purchase of the clean-diesel locomotives." "With our new agreement, we are requiring the purchase of these cleaner locomotives so that we will see much better air quality here at the ports." The event news release July 11, 2007 press releasePDF. Below left, Dr. Geraldine Knatz and Richard Steinke, Executive Direstors, Port of Long Beach/Port of Los Angeles. Below right, Los Angeles City Mayor Antonio Villaraigosa greeting Long Beach Mayor Bob Foster. 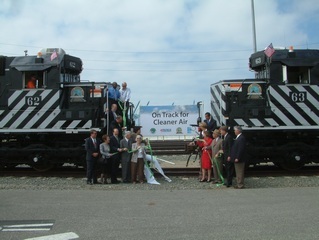 The first speaker was Long Beach Mayor Bob Foster who mentioned that the new locomotives achieve a 70% reduction in particulates and a 40% reduction in nitrous oxides. The ports must maintain a balance between health impacts and economic good which can be accomplished through teamwork and political will. The next speaker was Los Angeles Mayor Antonio Villaraigosa who thanked Geraldine Knatz, Mr. Steinke and LA City Councilwoman Janice Hahn. He stated that the ports are growing, working and coordinating together to grow bigger. 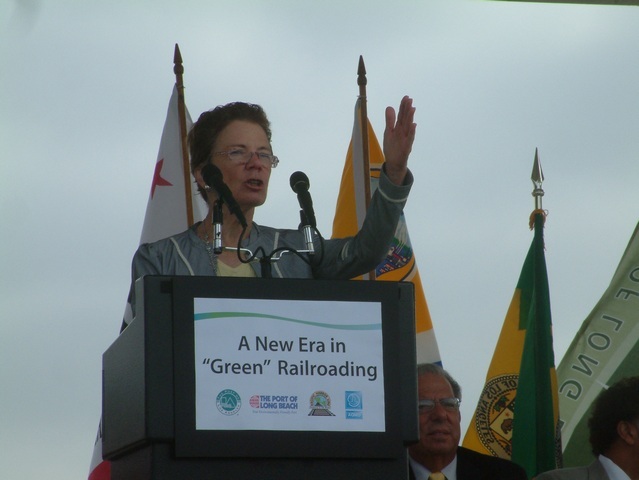 The cities and ports formed partnerships with business, labor and neighborhoods and crafted the plan for green locomotives and trucks. Even with a plan for 50% reduction of pollution in 5 years, some want to close the port due to health risks which would kill the economy. Mindful of of testimony that port neighborhood kids are sick due to pollution, Villaraigosa said there is "no excuse for half measures or failure." The future depends on sustained growth with one out of 24 jobs (in the five county region) being port related. 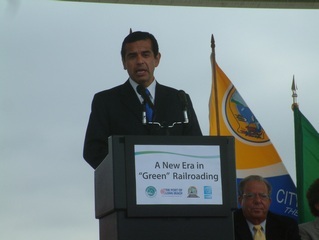 Villaraigosa is excited because he authored the Carl Moyer program for incentives for clean fuel vehicles while in the state legislature. The focus is on trucks and low sulfur emission on ships. He suggested to work together to grow greener, leaner and cleaner. Someone started a running joke about alma mater, so Villaraigosa made mention of being a graduate of UCLA. 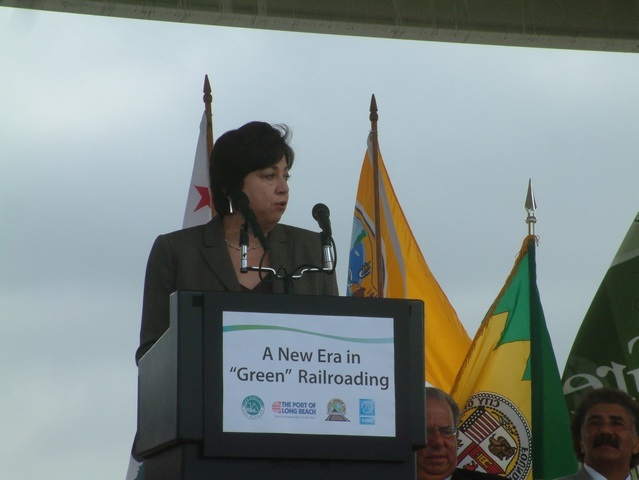 Next was Tonia Reyes Uranga, Councilwoman, City of Long Beach & South Coast Air Quality Management District board member and fellow Bruin who exclaimed “I love those trains!” The AQMD was responsible for a $7 million contribution to the locomotive replacement program. Her three main points were: 1) to recognize the ports of LB and LA and PHL. A clean up strategy was incorporated into a contract extension (through 2018) for PHL. Some of the railroad equipment being replaced is 50 years old; 2) recognize local community leaders to raise health impact versus local shipping operations; 3) AQMD is serious in "meeting standards sooner than later." She pointed out that it is challenging to clean up emissions due to monetary constraints, engineering and other factors. The AQMD has helped clean up industrial and automotive pollution. Now ships, trucks and trains are to meet simiilar standards as other transportation technology. 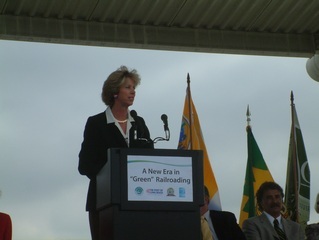 Next speaker was Janice Hahn, Councilwoman, City of Los Angeles, and Pepperdine graduate. 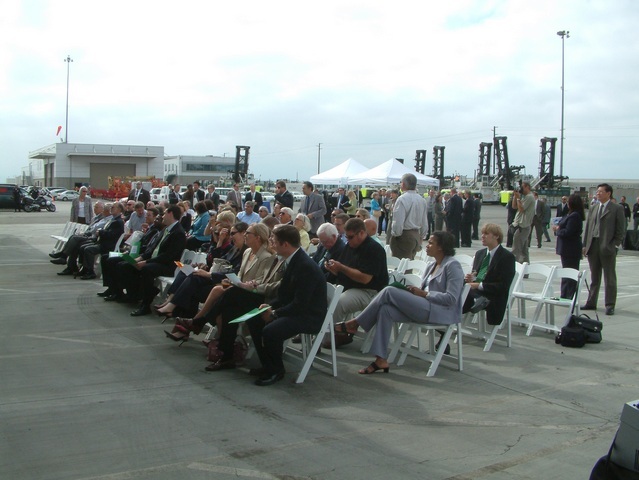 She called the dual port complex “America’s port” since the global economy depends on LB/LA. She was excited to have been involved in plugging in the first China Shipping vessel at the green terminal on the LA side. One ship can emit 7 tons per day of pollution. With 5000 workers on the docks on a daily basis, we can have growth and clean air, but we "should not bear the burden of bad health for the rest of the country." Below left, Tonia Reyes Uranga, City of Long Beach Councilwoman and SCAQMD board member. Below right, City of Los Angeles Councilwoman, Janice Hahn. Next speaker was Long Beach Harbor Commission President Mario Cordero who pointed out that it takes many to attain the clean air objective. Mr. Cordero asked a series of rhetorical questions starting with the dual ports of LB/LA being the "center of the global economy" ... "but how to stay there?" Business will grow. How to grow responsibily? How to deal with impact of health issues? Made these issues top priority. 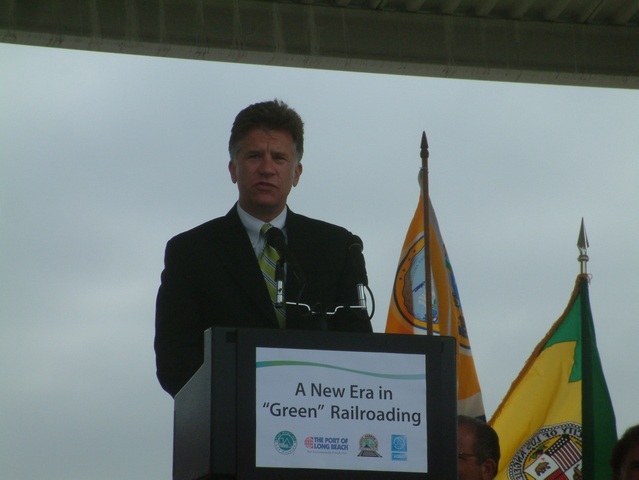 His organization has worked with PHL, the AQMD, and the Port of Los Angeles "to make PHL the most environmentally friendly switching railroad in the nation." 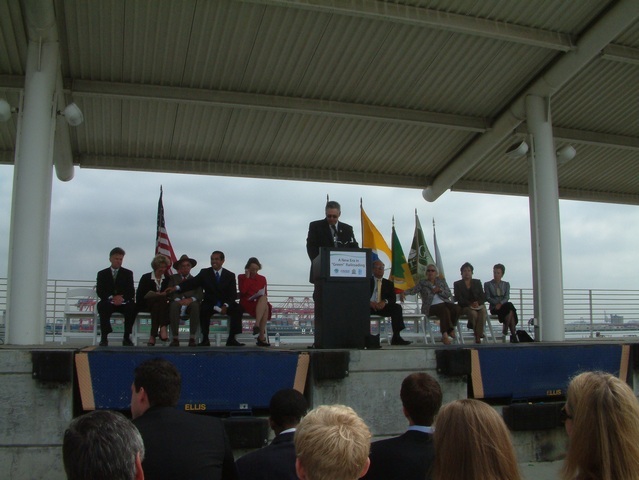 S. David Freeman was appointed to the LA Harbor Commission by Mayor Villaraigosa and confimed September 9, 2005. This management veterans words were brief, and aside from thanking LA Harbor Commission counterpart James Hankla (former head of the Alameda Corridor Transportation Agency) and the two Class I railroads, Union Pacific and BNSF Railway, Mr. Freeman said they were "on the march for a cleaner port." Mr. Freeman has held high profile public works positions over the last 30 years, including chairmanship of the Tennessee Valley Autority and head of the City of Los Angeles Department of Water and Power during the power crisis of the early 2000's. 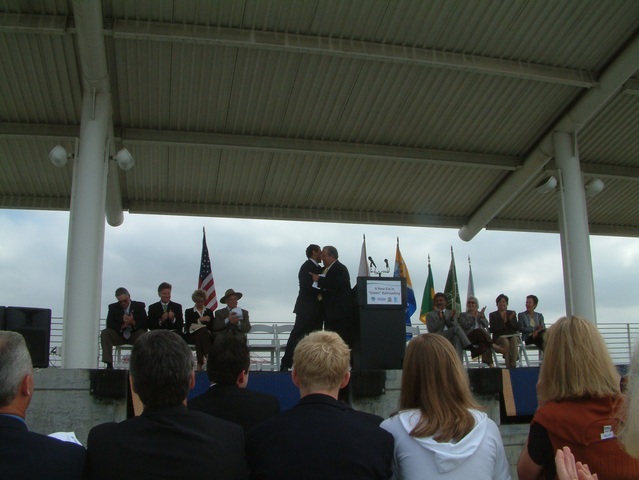 His Port of Los Angeles biography page credits him with "devotion to clean air, clean water, and renewable energy.". 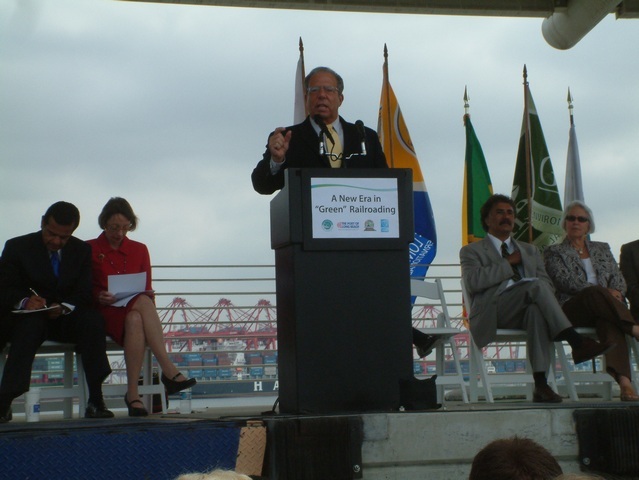 Below left, Mario Cordero, President, Long Beach Harbor Commission, California State University Long Beach Alumni. 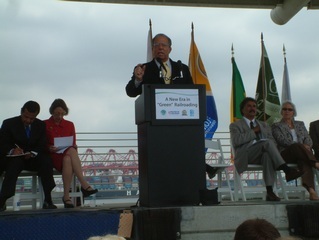 Below right, S. David Freeman, President, Los Angeles Harbor Commission. Billie Greer, Los Angeles Director, Office of Governor Arnold Schwarzenegger, thanked PHL and the entire green fleet, as the locomotive replacement program would help to "slash carbon emmissions." She called Governor Arnold Schwarzenegger and Mayors Antonio Villaraigosa and Bob Foster "green warriors". Greer thanked PHL for "stepping up to the plate" regarding locomotive replacment and that the state was "proud to contribute funding." She further commented that Cailifornia is growning a new economy based on "green" which will produce tens of thousands of new jobs. She equated PHL with a seam roller. 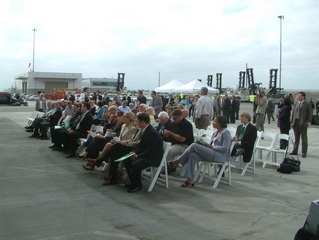 In his remarks, Peter Gilbertson, CEO, Anacostia and Pacific Co. and Chairman, Pacific Harbor Line pointed out that Pacific Harbor Line was established 12 years ago to be a "neutral, fair, and transparent swithcing operation" at the ports. This type of operation actually finds it "efficient to operate 50 year old locomotives. They are cheap to have." While the new locomotives cost $1.3 million each, PHL decided to help address the environmental issues by contibuting $10 million to the replacement program. Mr. Gilbertson also stated that the locomotive order was increased to include 3 additional Tier 3 compliant locomotives. The efficiency of rail transport takes over one million trucks off the road for short haul trips from the docks to near dock rail facilities. He further stated that greenhouse gases emmited by freight railroads amounts to one third the amount emmitted by recreational boats. PHL maintains a small fleet of hybrid automobiles. He touted that PHL was one of 4 other shortline railroads in the EPA Smartway Program in swhich railroads "will adopt green measures." The U.S. EPA Smartway Transport Partnership promotes fuel efficiency and reduction of greenhouse gases within the freight industry. Mr. Gilbertson stated that "PHL wants to be part of the solution" at the green port. 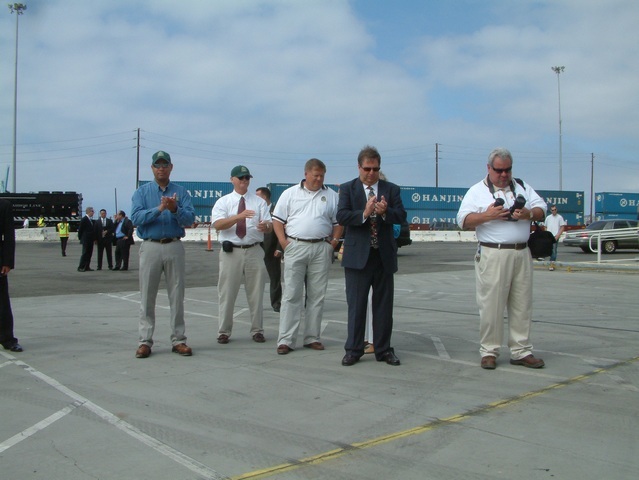 His thank you list ranged from the Ports of LB/LA to participate, SCAQMD, MotivePower Inc., and MTU Diesel. Regarding MTU Diesel, Mr. Gilbertson said this is the first application of MTU Diesel power in locomotives. He finsihed his remarks by recognizing all Pacific Harbor Line employees. Below left, Billie Greer, Los Angeles Director, Office of Governor Arnold Schwarzenegger. Below right, Peter Gilbertson, CEO, Anacostia and Pacific Co. and Chairman, Pacific Harbor Line. 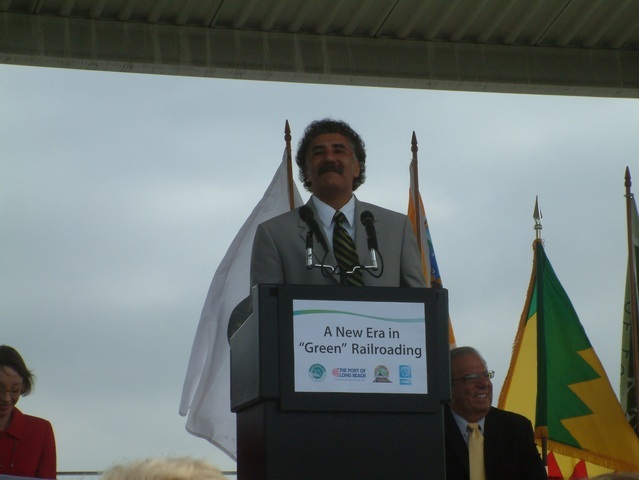 The final speaker was Don Hahs, President, Brotherhood of Locomotive Engineers and Trainmen. Mr. Hahs started his remarks on a humorous note by acknowledging the previous speakers had used his speaking points 4 times over. Mr. Hahs thanked the three railroads, BNSF Railway, Union Pacific and Pacific Harbor Line. He commented that PHL trainmen move 2 million containers annually while cutting 10,000 trucks daily.. He told us to "imagine traffic without the railroads." 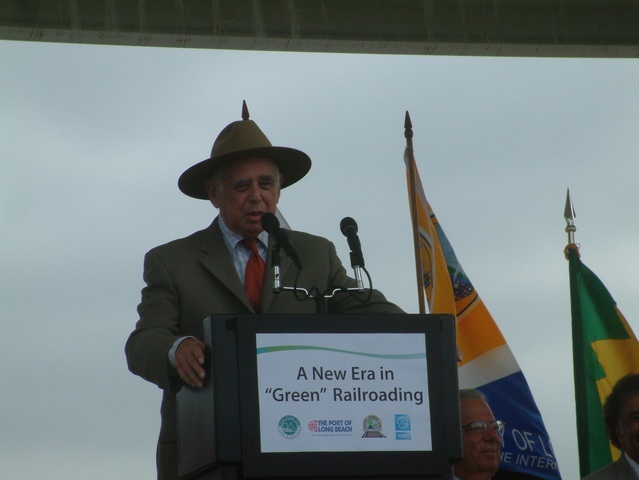 He called the locomotive replacement program a progressive model of public and private cooperation and "good business for all involved." PHL started with 17 people and has grown to 100 people. They are moving lots of freight with fewer good people. His last coment was another gem, saying to "keep on truckin, but do as much as possible by train." After Mr. Hahs, Mayor Villaraigosa made a brief speach in Spanish. Below right, Andrew Fox, President Pacific Harbor Line, and other PHL personnel. Below left, Don Hahs, President, Brotherhood of Locomotive Engineers and Trainmen. 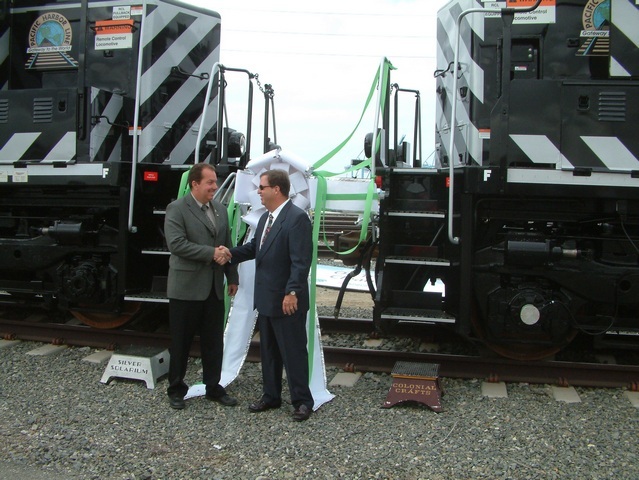 Below, Andrew Fox, President Pacific Harbor Line, and Carlo Luzzi, Port of Long Beach, Manager of Rail Transportation. 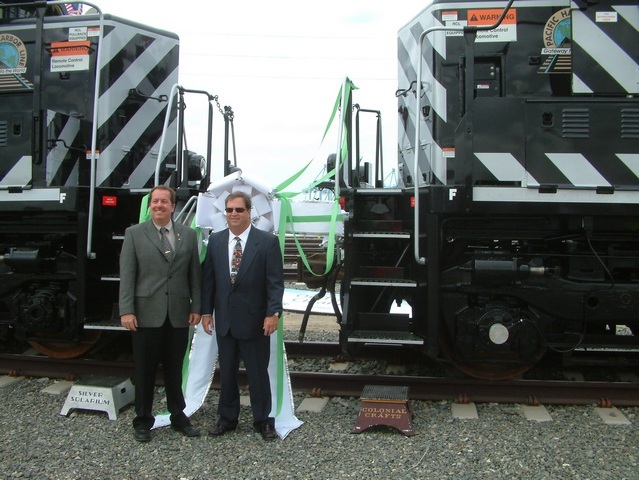 PHL locomotives 62 and 63 were displayed nose to nose for the tape breaking ceremony. This sight made me think of the May 10, 1869 Golden Spike Ceremony with number 119 and Jupiter at Promontory Summit Utahand and having made my first visit to the Golden Spike Historical Site less than two weeks before this event. What would 19th century railroaders think of low emission diesel locmotives and 1-1/2 mile long 10,000 ton trains? 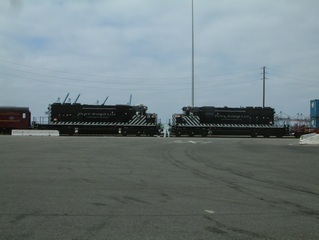 Single PHL locomotives routinely move extremely long intermodal trains around the port area. After the dignitaries took their places, the locmotives pulled away, thus breaking the tape.